Apple may not have unveiled the much-anticipated iPhone 5, and sure there are plenty of things missing from the 4S, but one element it did not skimp on was how impressive its Siri technology is. The intelligent assistant application’s abilities are as frighteningly far-reaching as we heard and hoped. Like you currently do to use Voice Control on the iPhone, Siri can be activated with a long-held press of the home button. Then all you have to do is speak to your handset. Voice recognition software isn’t terribly new. Google is one of the big names that has been making active strides in this technology with Voice Search, but dictation has remained a boundary between top-notch, efficient A.I. in our personal electronics. In today’s demo, Siri revealed you won’t have to speak like a language expert, or nearly talk in code to accomplish your desired tasks. By all appearances Siri will be able to interpret your intentions without much fuss. Ask your phone to call you brother—it will understand that that means to look up your brother’s name in your address book. And you won’t have to ask Siri to open your Fandango app to buy your movie tickets. Simply saying something like “I need three tickets for a showing at 7 P.M.” will be enough to notify the app to head over to Fandago and get the job done. If Siri isn’t able to deduce what you mean, if will ask you additional questions to get there. 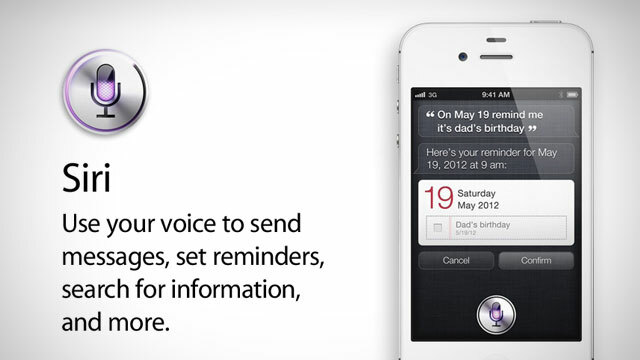 Siri is woven deeply into iOS so that it will function fluidly with all of your pre-installed applications. The technology allows it to check your notifications and it will even read it to you and reply to them for you. If you need to give someone an answer about your schedule, Siri will scan your calendar to check your availability and fill in the blanks for you. It will notify you of scheduling conflicts while you’re on the phone as well, without pause—you can keeping working while you’re working. You can also use Siri for dictation. A microphone icon in any app you use the keyboard for will let you input content via your voice. This is a more simplistic function of Siri, but an undeniably useful, hands-free feature. Like we mentioned yesterday in our preview of Siri, this application began with an impressive list of API access and this is what catapults it to being more than your iOS manager: It has the ability to be your everything manager. If the app were limited to dealing with your pre-installed iPhone services, it would be helpful but not as impressive. Siri’s access to outside app APIs is what takes it to the next level. And what’s more is that you don’t need to use computer-speak to get to that end. And like we said, instead of asking Siri to find you the highest rated Chinese restaurants in your location, you don’t have to ask for Yelp or Foursquare ratings—you simply need to ask where a close Chinese restaurants is. You don’t have to ask Siri to grab OpenTable to book you a seat or call the restaurant so you can do so—you just need to tell it to book you a table for four at the appropriate time. The possibilities are nearly endless. Connecting with friends on movie times, fetching information from ratings apps, booking appointments are just the start. And given the rate at which Apple fanboys adopt next-gen technology, Siri should only get more and more popular and gain access to more and more app APIs, making your iPhone as hands-free as it gets. Whether the iPhone 4S’ internal hardware has something to do with it or not, Siri won’t be available with older-generation iPhones. This obviously might just be a feature included to sell the new model, but either way you’re out of luck until you pony up for the iPhone 4S—or wait for the iPhone 5. We do have a few questions about Siri however. We’re wondering how well it will pick up your voice when you’re outside, and we’re already thinking about embarrassing situations in which Siri will read text messages out loud. But we’ll only know what the drawbacks will be come October 14.